Just a quick update to announce we have added an additional Rolling Surveillance class to our Colorado schedule. The first one filled and closed quickly. 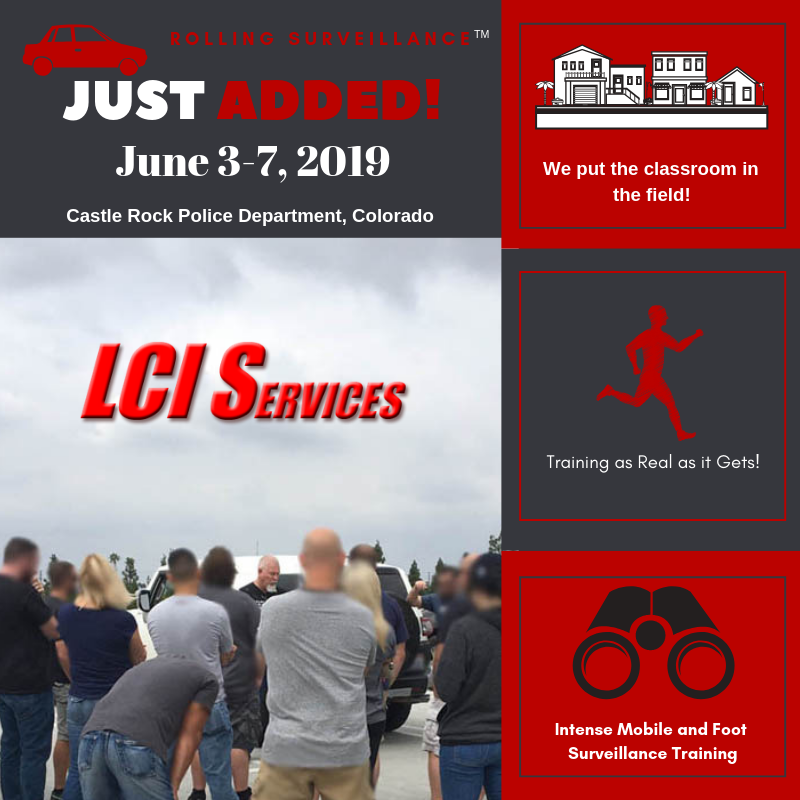 Rolling Surveillance will be held at Castle Rock PD in Colorado on June 3-7, 2019. We will cover many aspects of successful foot and mobile surveillance. The first day is in the classroom, then we take what is learned and apply it in the field, hands-on, with realistic scenarios. Beautiful Skies and Law Enforcement Training in New Mexico! This will be our 9th consecutive year of training in the enchanted state of New Mexico. These will be our last courses for 2018, but we will pick it up again in 2019! September we will start in Albuquerque and in October we will wrap it up in Las Cruces. We hope you can join us for the best in law enforcement training (for the subject matter presented), some of the most flavorful Mexican food you will ever taste, and enjoy viewing the breathtaking skies! During your free time, you might choose to see some Native American and Wild West History. You could possibly visit the places they filmed Breaking Bad and Longmire for some great photo ops. You can register online today. Classes are filling quickly, be sure to secure your spot, as class size is limited to ensure you get quality training in the field, with our intense hands-on approach. Thank you, Oregon State Police! Earlier this month, we had the privilege of training in Central Point, OR at the Oregon State Police station. We are very grateful to those who arranged this and made it possible. This was our first training in the Medford region and we had a wonderful time with the law enforcement professionals who attended. This truly was a great bunch of guys and they performed very well as a team during Rolling Surveillance field exercises. It was our pleasure when many of them came up at the end and shook our hands and thanked us for bringing this class to them. We hope to be back soon! It was a lovely drive to and from this Rolling Surveillance class. Oregon is full of breathtaking scenery. Many streets were lined with flowering trees and in the background, the mountains were all capped with snow. The ornamental cherry trees were all in blossom, as were many pear trees. We also were able to taste test and buy some of the best cheese, mead, honey, and pears while visiting Oregon.